Here's where you can find essential oils to use for aromatherapy, cleaning, DIY skin and hair care products, and craft projects. Mountain Rose Herbs is where I shop for the best quality essential oils at the best price online. MRH sells certified organic and fair trade essential oils. All their oils are therapeutic grade, meaning they are safe to use on your skin and hair (when diluted). This is true of all essential oils. It's what makes them different from fragrance oils, which are made with synthetic ingredients. Your local herb store may sell essential oils too. This is a great place to buy essential oils because you can support a local business. I've purchased essential oils at Flower Power in the East Village. That store is magical! Whole Foods Market sells essential oils in their stores, which I find incredibly convenient. You can find them in the body care aisle. They have a 365 brand, which is fairly priced. I've seen other brands like Aura Cacia there too. Many health food stores usually sell at least one brand of essential oils so check out your local health food store next time you're there. When I lived in Brooklyn, I purchased my essential oils at the Park Slope Food Coop. This is the cheapest place to buy essential oils-- and everything else, really. The coop is member owned and operated so it does not mark any items up more than 21% (compared to 26-100% at a supermarket). Amazon is another place where you can purchase essential oils online. Many sellers offer reputable brands like NOW organic and Aura Cacia. It's a good idea to poke around and see which sellers sell the best quality oil you are looking for at the best price. I've honestly never purchased EOs on Amazon because I think the shipping makes it too expensive. However, if you have a Amazon gift card and really want EOs, this is a great option. I've also seen tea tree oil in my local CVS drug store. I was totally surprised! 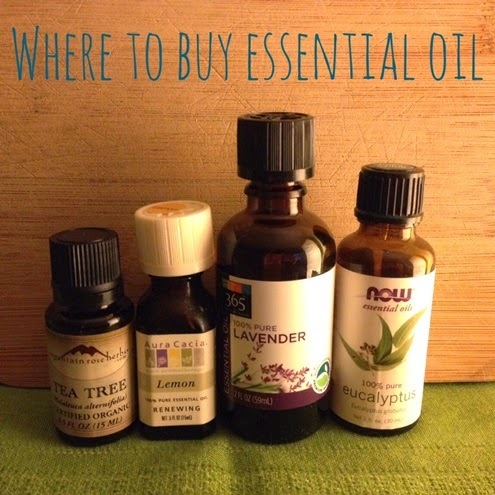 Where do you buy essential oils?